Welcome to our Bible journaling series! Have you been following along? 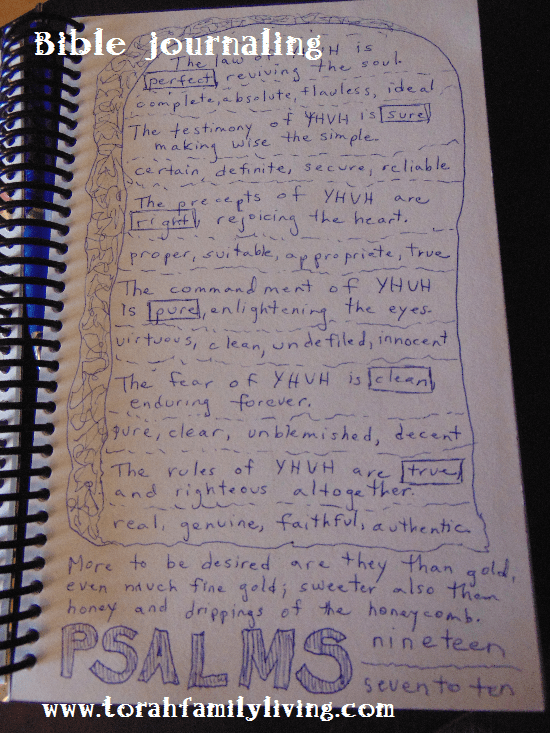 Today’s journal page features Psalm 19:7-10.
the fear of YHVH is clean, enduring forever; the rules of YHVH are true, and righteous altogether. Many of you are probably familiar with this passage. I learned it set to music. You might even be singing the song right now. When we are familiar with a passage, I think it is that much more important that we study the passage more in depth. Otherwise, we tend to repeat the words without allowing our mind to ponder the deeper meaning. We can get a better handle on a passage if we look for key words. This passage is set up in list form, so it wasn’t that hard. In Scripture, the words law, testimony, precepts, commandments, rules, statutes, etc. all are referring to Torah. All other Scripture builds on this foundation. So, in this passage, we are looking at several descriptors of Torah. I put boxes around the words perfect, sure, right, pure, clean, and true. Some of these words can seem a bit vague at first, so let’s use our handy thesaurus to help. As we saw in a previous passage, looking up synonyms can be very helpful in better understanding a passage. Here’s what I came up with when I looked up my key words. Wow! When you look at all those descriptors, Torah is just amazing, isn’t it? It is complete, true, faithful, flawless, and genuine. We can solidly trust in YHVH and His Torah. Want to learn more about Bible journaling? Be sure to read these previous posts.